Home / Editor's Choice, Entertainment News, Featured Articles, Gossip and Drama, News, Politics / A man must survive, See how this Guy conned his own mother 10K, Sounds wicked and at the same time funny, Eh! Eh! 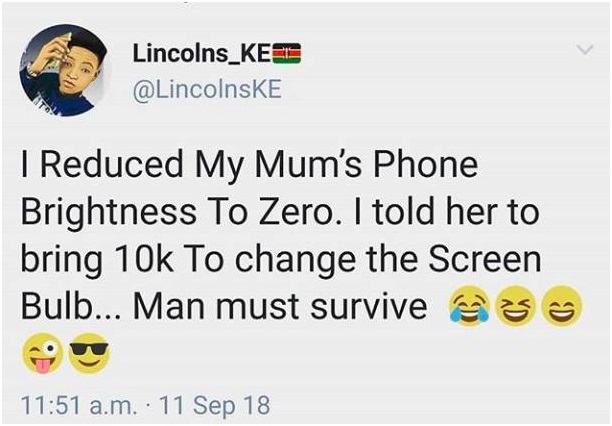 A man must survive, See how this Guy conned his own mother 10K, Sounds wicked and at the same time funny, Eh! Eh! Thursday, September 13, 2018 - This tweet will brighten up your mood this sunny Thursday. This guy played tricks on his own mother and got Ksh 10,000 using cunning tricks. It’s sound wicked and funny.